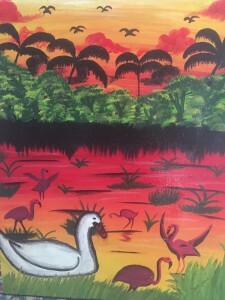 Bidding begins July 1st for this beautiful artwork created by Javier Lopez, a 2016 Chacocente Christian School graduate. He has donated a 15 ½ by 19¾ oil-on-canvas painting to the school to be used for fundraising. Javier is grateful for the support of the teachers he had at Chacocente and hopes his painting will raise lots of money so other children in his neighborhood can attend school. Since graduating from Chacocente Christian School, he is continuing his education to become a graphic designer. Please help us promote this fundraiser by sharing the site on your Facebook page!